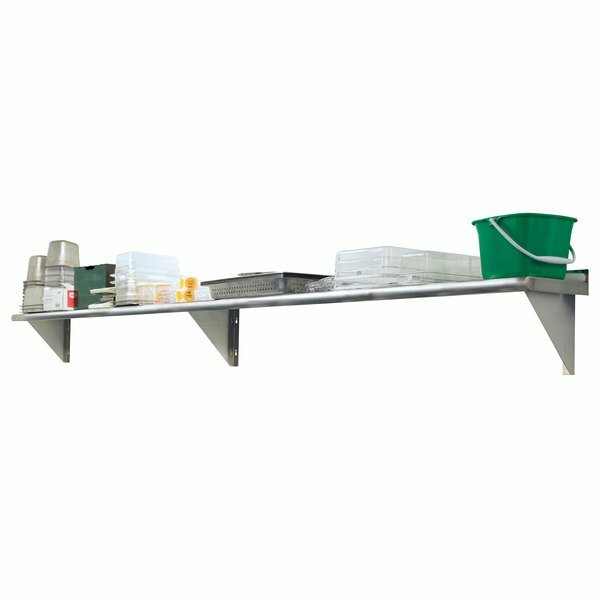 The Advance Tabco WS-18-60-16 stainless steel wall shelf is a convenient storage option for any commercial kitchen, offering plenty of room to store canned food, small preparation tools, and more! The 16 gauge type 304 stainless steel construction gives this shelf excellent durability and corrosion resistance, a necessity in any commercial environment, while the satin finish ensures a professional appearance that blends into any kitchen design. This shelf comes with a rolled, 1 5/8" bullnose front edge, turned down square sides, and a 1 1/2" turned up rear edge. It can be bolted to a wall through the 2 included support brackets for easy installation. The brackets may be adjusted from side to side to allow for variances in the wall studs.